PanARMENIAN.Net - The Bulgarian Parliament has ratified the Comprehensive and Enhanced Partnership Agreement (CEPA) between the EU and Yerevan, Armenia's embassy in Sofia said in a Facebook post. Bulgaria, which currently chairs the Council of the European Union, has become one of the first EU member-states to approve the agreement. Poland, Estonia, Latvia and Lithuania ratified the CEPA earlier, while the Armenian parliament approved the deal for good on April 11. The negotiations on the new EU-Armenia partnership agreement were launched in 2015 and concluded in 2017. It was then signed by both sides in November 2017. 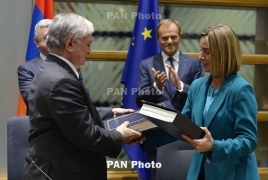 The final agreement marks a deeper EU-Armenia political dialogue, broadens the scope of economic cooperation and provides new opportunities for closer ties on energy, transport, infrastructure, environment, trade, education and other sectors.